The Portrificationizer Chamber, also called the Ghost Portrificationizer Room, is a location housed in Professor E. Gadd's lab in Luigi's Mansion. The room was specifically designed to house the large Ghost Portrificationizer. Luigi only visits this room after defeating an area boss in mansion. 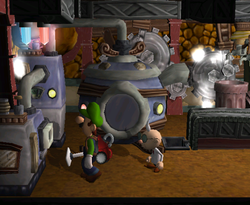 Like The Lab, Luigi cannot freely roam around the location. The final cutscene takes place in this room, which shows Mario being transformed from a painting and into his normal self. The Portrificationizer Chamber in the Nintendo 3DS remake. There is a door at the very right of the room. Although it cannot be entered, this door leads to the Gallery (according to the Game Boy Horror). Another door also appears at the start of the room, which leads to The Lab, although it is not visible. ↑ Hodgson, David S. J., and Bryan Stratton. 2001. Luigi's Mansion Prima Official Strategy Guide. Page 6. 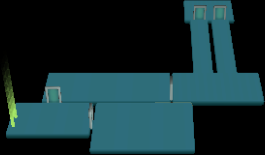 ↑ Luigi's Mansion unused file "e_labo.bti"
This page was last edited on February 7, 2019, at 18:15.